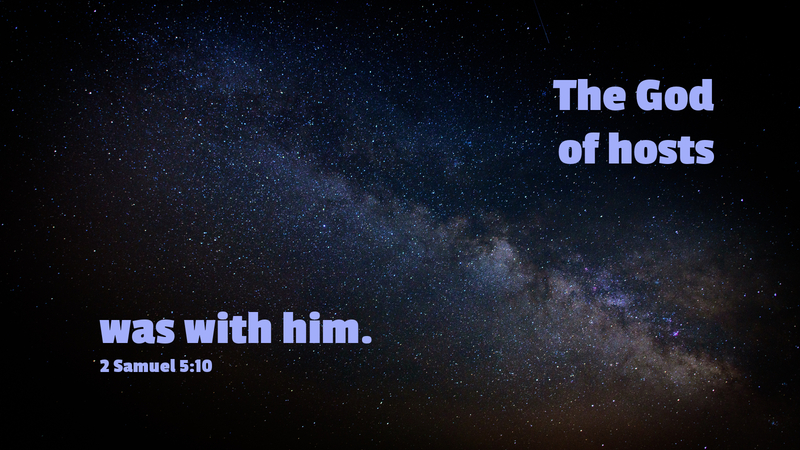 What might happen if you knew that the Lord was with you? David conquered every stronghold and reigned as king. The early believers “turned the world upside down.” Jesus healed people of unclean spirits, deafness, and impediments and diseases of all kinds. All of these people did great things because they knew that God was with them. They believed and moved forward in faith. Yet this was not without cost. David lost his best friend and had to wait for years before he became king. Paul, Silas, Timothy, Jason, and the other brothers were arrested, prosecuted, and hounded from city to city. Jesus was eventually crucified. Despite the difficulties, all of them believed that God was with them—and that made the difference. They could all move forward because they knew the Lord had established them. They believed that God was with them even when problems came their way. Do we? Do we believe that God is with us and has established his kingdom in our midst? If so, then we may go our way in faith, for if God is for us, who can be against us (Rom 8:31)? Prayer: Help me to stand in faith today, Lord Jesus, by the power of your Holy Spirit. Amen.